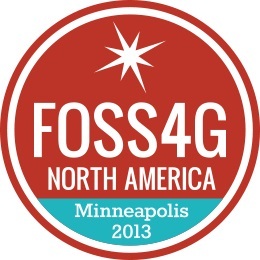 North America Conference (FOSS4G-NA), which took place May 22 through May 24 at the Minneapolis Marriott City Center and was attended by nearly 400 people. 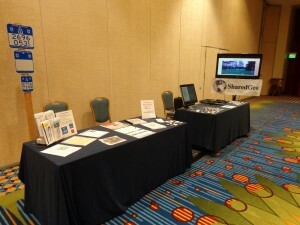 SharedGeo Executive Director, Steve Swazee, and Technical Director, Bob Basques, shared and discussed SharedGeo’s wide range of capabilities, products, services and projects with FOSS4G-NA attendees. Mr. Swazee introduced enthusiastic FOSS4G-NA conference-goers to SharedGeo’s many ongoing projects, like the U.S. National Grid Emergency Marker project (USNG), and distributed fliers about SharedGeo and the Director’s Blog. Mr. Basques engaged attendees with technical and coding information about SharedGeo’s variety of open-source software products, while showing demonstrations of 3D Maps in browsers and videos of drone flights. Mr. Basques and Cory Karsten also delivered a well-attended presentation about their Automatic Vehicle Location (AVL) implementation efforts in the City of St. Paul. SharedGeo Administrative Director, Nancy Read, also played a key role at FOSS4G-NA by leading SharedGeo’s role of fiscal agent for the conference. In addition, Dr. Read presented with Brian Fischer of Houston Engineering on the open source suite of software being used at the Metropolitan Mosquito Control District. Dr. Read and Mr. Basques—along with representatives from the DNR, Portland TriMet, and AppGeo—also served as panelists for a discussion on the use of open-source software for state and local governments. SharedGeo was also represented by Chief Programmer and Technology Developer, Jim Klassen, who served on a panel of experts that discussed the merits of various geo-portals. Mr. Klassen also met with GeoMOOSE coders for a code sprint on the final day of the conference. 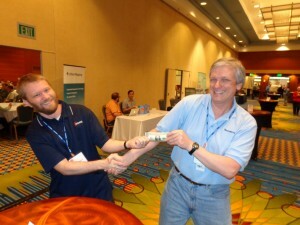 The success of the FOSS4G-NA 2013 was due in large part to the leadership of David Bitner, owner of dbSpatial LLC, along with a team of dedicated volunteers.